Can we really trust Sega now? My HUGE Sega Saturn Collection of goodies! "Daddy! why does it have to die?" Remember when this CD system was still on the market, eh? The successor to the Sega Genesis showed a lot of promise but the 32-bit Sega Saturn got killed by several things. For example: strong competition from both the N64, and Playstation, lack of faint in Sega from retailers (32X, Sega CD anyone? ), and a weak 3D engine so many recent arcade titles like Daytona USA looked watered down, those stupid and expensive Memory carts with tons of side effects, a scary 599.99 starter price, Virtua Fighter looking kind of blocky, the Saturn mascot Bug just didn't get the public's attention, Sonic Extreme (the answer to Super Mario 64) got canceled, the system ran a battery so you will lose your internal memory someday ............. just to name a few (I could go on, man). The Saturn had a lot of serious problems and Sega was no longer the invisible gaming giant they once were. It wasn't all bad though because in its run the Saturn had some pretty good and pretty rare Role Playing Games like the amazing Panzer Dragoon Saga, the rare sequel Shining Force III, and the unique Dragon Force. Plus the Saturn also had a strong collection of unique 2D games as well like Shinobi Legions, Marvel Super Heroes and Astal to keep players happy. 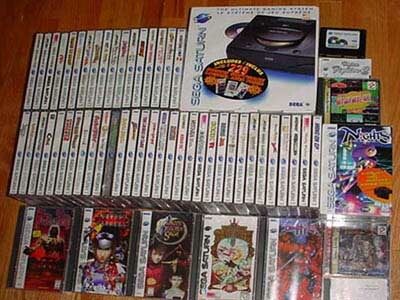 Although the Sega Saturn was considered by many to be a failure in the North American market, the same can not be said in Japan where there are over 500 Saturn games release for the Japanese market alone. If you have a Sega Saturn Game Shark you now have the option to look for unique Japanese only games like Radiant Silvergun, Dracula X, and Graduis Gaiden. Plus let's not forget that the Sega Saturn was the first home video game system ever to be online thanks to the Net Link adapter. That was very innovative for its day. If you hit your head and somehow would like to buy a Saturn now is the time to buy, because it's getting harder and harder to find these 250+ games and accessories in the discount bins. The Saturn can be a good and interesting system if you find the right games like the original Nights, the deep Virtua Fighter series, and many more local and import titles. The system's 6 button controller is also great for any game in the library and it is especially good for all the different fighting games. On a final note also remember that this game system is NOT compatible with any other Sega system and that's another knock against it. Buy with caution. With the Sega Saturn only having limited back up storage (if you have an active CR 2032 Lithium battery) to save games, Sega introduced a separate Memory Cart for games that take more space like Shining Force III, Panzer Dragoon Saga, and other huge RPG's. This is a rare find and well worth it if you can this cartridge that is similar to a regular genesis cart. Sadly these carts can only be inserted before the system is turned on and if you risk placing a cart in the slot during game play then it may wipe out all your data. It's very frustrating and the Sony memory system was far superior to this. Rating: 53/100 an OK enough system for people who can't afford a Playstation or game collectors but casual players will hate system's interface. Find the Sega Saturn on eBay here! Rare Scale: 2/10 still kind of common now, but let's see in a few more years. *Some of the games may look grainier, but they're not too different than some of the Playstation games. *It's a underrated game machine overall. *You want to save your game but your battery is dead and you don't have an expensive save cartridge either. *Going though those annoying menus all the time if you run out of battery power.